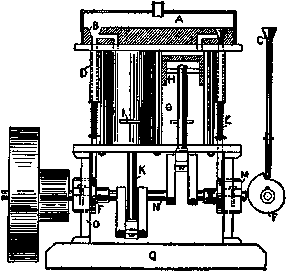 The accompanying sketch illustrates a two-cylinder single-acting, poppet valve steam engine of home construction. The entire engine, excepting the flywheel, shaft, valve cams, pistons and bracing rods connecting the upper and lower plates of the frame proper, is of brass, the other parts named being of cast iron and bar steel. The cylinders, G, are of seamless brass tubing, 1-1/2 in. outside diameter; the pistons, H, are ordinary 1-1/2 in. pipe caps turned to a plug fit, and ground into the cylinders with oil and emery. This operation also finishes the inside of the cylinders. The upright rods binding the top and bottom plates are of steel rod about 1/8-in. in diameter, threaded into the top plate and passing through holes in the bottom plate with hexagonal brass nuts beneath. The valves, C, and their seats, B, bored with a countersink bit, are plainly shown. The valves were made by threading a copper washer, 3/8 in. in diameter, and screwing it on the end of the valve rod, then wiping on roughly a tapered mass of solder and grinding it into the seats B with emery and oil. The valve rods operate in guides, D, made of 1/4-in. brass tubing, which passes through the top plate and into the heavy brass bar containing the valve seats and steam passages at the top, into which they are plug-fitted and soldered. The location and arrangement of the valve seats and steam passages are shown in the sketch, the flat bar containing being soldered to the top plate. The steam chest, A, over the valve mechanism is constructed of 1-in. square brass tubing, one side being sawed out and the open ends fitted with pieces of 1/16 in. sheet brass and soldered in. The steam inlet is a gasoline pipe connection such as used on automobiles. The valve-operating cams, F, are made of the metal ends of an old typewriter platen, one being finished to shape and then firmly fastened face to face to the other, and used as a pattern in filing the other to shape. Attachment to the shaft, N, is by means of setscrews which pass through the sleeves. The main bearings, M, on the supports, O, and the crank-end bearings of the connecting rods, K, are split and held in position by machine screws with provision for taking up when worn. The exhausting of spent steam is accomplished by means of slots, I, sawed into the fronts of the cylinders at about 1/8 in. above the lowest position of the piston's top at the end of the stroke, at which position of the piston the valve rod drops into the cutout portion of the cam and allows the valve to seat. .
All the work on this engine, save turning the pistons, which was done in a machine shop for a small sum, and making the flywheel, this being taken from an old dismantled model, was accomplished with a hacksaw, bench drill, carborundum wheel, files, taps and dies. The base, Q, is made of a heavy piece of brass. The action is smooth and the speed high. Steam is supplied by a sheet brass boiler of about 3 pt. capacity, heated with a Bunsen burner. --Contributed by Harry F. Lowe, Washington, D. C.